Korda are firm know long established, and associated with quality end tackle for today's discerning carp angler. KRUSHA has been developed to pulverize the hardest of baits into fine crumb. The perfect tool for blending PVA bag mixes, spod mixes ingredients or a handful of boilies, the krusha does the job quickly and efficiently. Suitable for use with, tiger nuts, any kind of particle, trout pellets and boilies. For hempseed, best results are achieved in conjunction with the small krusha. New Adrena-Line this is korda,s first mainline. Designed for maximum abrasion resistance, increased distance and camouflaged to " break up" the line in the water. Compared by diameter, this is the toughest you,ll use .Available in 1000m and 250m spools in breaking strains 10lb up to 18lb. Supernatural is an original and uniquely different hook link material that has been developed by the korda team to provide the ultimate combination of suppleness, softness and strength. 18lb/8.2kg weed green and gravel brown. ideal for all carp fishing situations. Hybrid stiff coated braid is ideal for combi-links etc. Available in 20lb (9.1 kg) in Weed Green and Gravel Brown. 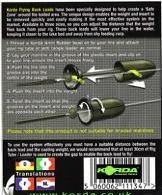 Korda Carp Care Kit is essential item for all responsible carp anglers includes treatment for mouth and scale damage a great bit of kit £13.99. I.Q2. Extra soft fluorocarbon has been developed for those who want a softer hook link. it refracts light in almost the same way water, making almost invisible when immersed water. Available in 20m spools and in breaking strains of. 10lb, 12lb, 15lb and 20lb. Korda Hybrid Carp Hooks are a cross breed of the best parts of modern day carp hooks utilizing Team Korda's many thousands of hours on the bank. Rig Rings have been specially designed to help the angler create a variety of different rigs for the ever changing demands required to catch carp today. Another new design from Korda, a purpose designed knot puller that is manufactured from stainless steel and ABS plastic. 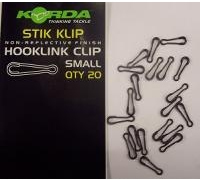 Korda Stik Klip has been designed for the easy attachment of hooklinks that use a loop at one end when using the 'Dynamite Stik' method. Crucial for speedy and secure rig changes. 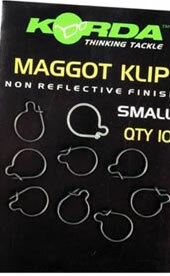 Korda's Maggot Klip has been designed for the easy attachment of maggots. The clip style, means that maggots can be 'threaded' on to the point quickly and easily without the need for using any additional needles. The small eye can be tied on to the hair, or attached to a Korda Micro Rig swivel for further rig permeations. In sizes small, medium and large. The long awaited mini version of our market leading SkyLiner spod will deliver a hemp payload of 1.6 ounces to ranges of up to 80 yards. Best suited to introducing small quantities of bait with minimal disturbance or for topping up the swim during the session. The Mini SkyLiner can be used on a standard carp rod without requiring a leader or other specialized spodding gear. The SkyRaider is a purpose built distance bait rocket which the korda team has designed specifically for spodding at ultra long range. The size, shape and aerodynamics have been calculated to gain maximum aerodynamic performance with minimum wobble in flight and reduced affect by crosswinds. The SkyRaider delivers a hemp payload of 3.2 ounces when full. To achieve the ultimate in distance the body has a slight taper- due to this we advise against very 'stodgy' spod mixes and also recommend allowing a little extra time for the bait to fully disperse from the SkyRaider body. The Korda Lead Clip is a lead release system designed to perfectly compliment Korda swivel leads. Extensive field testing has ensured you can decide when you want the lead to release. Available Colour's – Weedy Green or Muddy Brown or Khaki. 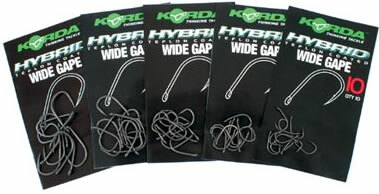 Korda Flying Back Leads have been specially designed to help create a 'Safe Zone' around the baited area. The unique design enables the weight and insert to be removed quickly and easily making it most effective system on the market. Korda Silicone Sleeves-Multipurpose Silicone sleeves for covering swivels on Leads, Kwik Links or Stik Klips. Korda's Shok Bead has been specially designed for a multitude of uses. Its unique shape helps prevent tangles and the cavity will hold a swivel within it securely. 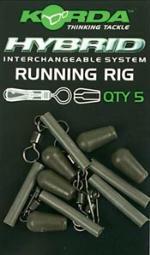 Ideal for running rigs or for using with marker floats or any set up that requires a buffer type bead. Korda Rubbers have become some what of an institution when it comes to finishing off a rig, they were originally designed as a purpose made connector between the top of an in line lead and the rig tube. A great addition to the carp anglers rig box Extenda Stops allows the angler to increase the length of the hair without tying a new rig great idea. Available in 3 sizes with 2 cards per pack. Are a cross breed of the best parts of modern day running rigs. the large eye of the special swivel creates very little friction greatly enhancing the bite indication, the small lead link and silicone sleeve combine to form a very neat, tangle free system £3.35. This dedicated marker kit contains all the components required to assemble an advanced marker float set-up enabling tangle free, long plumbing. allows the float to rise smoothly even in heavy silk weed or at extreme range. Ultra smooth nylon ring to improve bite indication, should it become snagged the back lead will release. Korda was the first company to bring anglers the funnel web concept. Each system has 7m of P.V.A. on it. The Korda Lead Clip Action Pack has been specially designed to construct one of the most popular lead attachment systems. 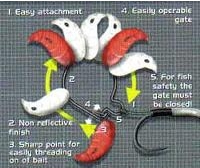 Simple to set up, the system easily discharges the lead should it become snagged whilst playing a fish. 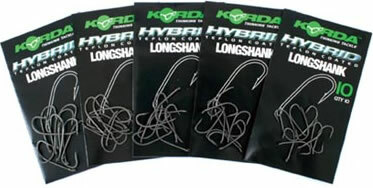 Korda Arma-Kord is an incredibly abrasion resistant braided line, which is also supple and thin for its strength. It has been designed as a high performance snag/ shock leader for extreme snag or long rage situations. Kamo Leaders have been specially designed to help create a 'safe zone' around the baited area. The unique colour's and design have come from the hundreds of hours of watching carp's behavior around rigs and leaders whilst filming the 'underwater' series of films. The translucent, subtle colour blends in with the lake bed, whilst being kept pinned down with the tungsten collars away from wary feeding fish.